Getting expert advice can really help when making a tough decision...though on the other hand, you could just make your inexperienced 29-year-old son the GM of an NFL team and see how that goes. 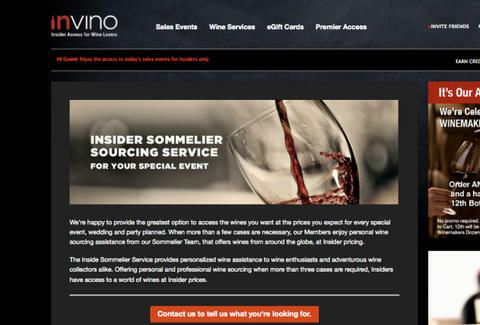 For a new undertaking that offers up advice even the Yorks might listen to, check out Invino's Insider Sommelier Sourcing Service. Launching today, Sonoma-based wine sale site Invino is hooking up members with access to the first-ever free online sommelier service that'll provide you with trained wine dudes who'll privately help pair ridiculously discounted vino offerings for your next special event, house party, or Tour de Franzia. For access to Invino's Sonoma-living Level One-certified sommelier (and a half dozen expert-paletted winemakers and vineyard owners) you'll become a member (which is totally free), fill out a quick questionnaire with your personal deets, then hook up the specifics on the party (event description, food served, estimated number of guests, wine delivery date), and finally wine requirements (number of cases, desired budget) and wine requests, like "I like Cabs! ", though clearly that's something no one in SF should ever say. The site then does the rest, using its crack wine-glugging team to compare tasting notes on hundreds of bottles, narrowing down the field with your specifications before sending you 6-12 vinos to taste test and make the final call, which Gus Johnson has already requested as the title of his obituary. The minimum order for the sommelier access is three cases, all of which'll come packed with gratis wine periodicals like Wine & Spirits, which would be running higher around Candlestick if young Jed had taken a seat a little bit earlier.